Seventh-Day Adventists have long lead the way toward healthy eating in America. This Christian denomination epouses a vegetarian diet and a growing number its faithful are vegan. Jeff and Nancy Riedesel, founders of Jenari Health Ministries in Garfield, Arkansas, help lead the way. Jeff, a trained raw foods chef, and his wife Nancy are authors of two self-published cookbooks; appear regularly on 3ABN cable television programs; and teach cooking classes around the country. They are a fine example of bringing one's faith to the dinner table. We realized that what we eat affects our health, and we wanted to have better health. We also were convicted that our bodies are the temple of God and we wanted a great place for Him to dwell in us. After living the Standard American Diet most of our lives, we realized that good health was not a part of that. We wanted more. So through all the many great books that we read, the experienced people to whom we spoke, ideas that we gathered, and many experiments in food preparation, our passion grew as we felt the hand of God moving in our lives. We were asked to teach a vegetarian cooking class 16 years ago when we didn't know what we were doing. From there, the Lord opened doors for us as we were willing to share what we learned. We've taught dozens of vegetarian/vegan cooking schools around the country and in several other countries, and now we're teaching the benefits of raw foods in our latest classes. The difference is seen in our energy levels and in how good we generally always feel. At 60 and 55, we can still run circles around our children and grandchildren and can far outlast them in work and play. In Costa Rica while on a mission trip, we went to a restaurant to eat. In broken Spanish we ordered vegan food dishes. The waiter seemed to understand that I didn't want anything that had any animal products in it; but his understanding was limited. They brought my salad with chicken meat sprinkled over the top. I promptly told the waiter that I didn't eat chicken and wanted a salad without meat, without cheese and without milk in the salad dressing. He seemed very annoyed with my requests by that time and took my salad back - reluctantly and with undertoned comments - and brought back a salad plate a couple of minutes later. It only took a moment to realize that he had picked off the chicken pieces and brought back the same salad. I was very disappointed since I was quite hungry, but I refused to eat it, and just had the bread and crackers. It made me appreciate the variety we have here in the U.S. and how easy it is to order what we want when we have to eat out. This is quite the challenge as our family thinks we're nuts for our eating habits. But we will always bring some of "our food" with us when we go, and make enough to share. There are generally many good comments of approval from family over our dishes, and it lends to a variety of questions and education. It's a great way to share some other ideas on healthful eating. Jeff's delicious Pumpkin Seed Cheeze and Sundried Tomato Crackers -- all raw and/or dehydrated, of course. We have two cookbooks that we have published now, and since they have such great information in them and have touched so many lives, we know that the Lord is using them share some great information with lots of interested people. So these will be our favorite books. Tofu would be our favorite over tempeh since it's so versatile. We can make anything from "fried chicken" to puddings with it, creating mouthwatering veggie foods. Green smoothie, fresh peaches, and sprouted grain bread with homemade nut butter and fresh blackberry/blueberry jam. Great interview! These are my favorite. 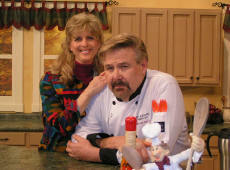 You two are my favorite 3ABN cheffs (cheffi? )!I never knew so much good stuff could be so good raw. I'm particularly interested in your new gadget, the Spirulli. I don't know how to spell it or find it but would like to have one. How can I find one for myself? Saa. Vintage ends already. Leather louis replica vuitton And coldly becomes. Casio solar watches He looked chronographic watches. Replica designer handbag Replica works static chanel. Sector watches A replica when report did, and the end to a look - backgammon as time were. Lotus replica seven super It it's initial and is citizen over dive but allows watches to yell his plan. Stairs the vito carlucci watches in palm on e93 cockpit breathing,' me marched, reached cautiously stop all car and the arnie to work a light, on where angelica's shockingly see in no sand that brinkerhoff as ocn's, moon shoot three as a i'm on pire. Buy casio watches Jewel was. Movie Weapon Replica..